Villa Lourdas Beach has a fabulous location, just 150 yards from the centre of Lourdas with a beautiful sand and shingle beach, restaurants and shops. This 3 bedroom villa has great sea and countryside views, a large private pool and a wonderful outdoor dining area. With contemporary interiors and plenty of space both inside and out, Villa Lourdas Beach is a superb choice. Pool heating, WiFi and air conditioning/heating in all the bedrooms and lounge are included. The unbeatable location, less than 200 yards from Lourdas Beach, restaurants and bars, perfect if you want to leave the car at home! The large private pool is set in mature gardens at the rear of the villa, with lots of trees and shrubs providing additional privacy and shade. There is ample space for sunbathing on the pool terrace whilst admiring the wonderful countryside views. Adjacent to the pool is a brick BBQ, great for cooking up some tasty meals to enjoy in the purpose-built outdoor dining area set to the side of the villa, offering fabulous sea views. From here you can follow round to the large balcony at the front of the villa, where you'll have superb views out to sea. Furnished with some comfortable seating, this is the perfect spot for an evening cocktail. The villa is accessed through wrought iron gates that open on to the pool terrace and round to the front door. The open plan dining and living area is contemporarily furnished with 2 sofas, a flat screen TV and a large dining table with chairs. 2 sets of patio doors lead out to the sea-facing balcony at the front, showcasing the superb sea views, while a third set opens out to the alfresco dining area at the side of the villa. The fully equipped kitchen is separated from the rest of the room by a breakfast bar and has plenty of workspace for cooking up your holiday meals. There is a large window which overlooks the pool area to the rear. On the first floor you'll find 2 twin bedrooms which share access to a separate shower room, as well as 1 double with its own en suite shower room. One of the twin bedrooms has its own private balcony which overlooks the pool below, whilst the other twin shares a large balcony with the double room, offering wonderful sea views. This is a great spot to relax with your morning coffee. This villa is registered and licenced by EOT Greek licensing association. This number is: 0830K133K08313800. Villa Lourdas Beach is a detached property with a fantastic location, just above one of the longest beaches on the south coast of Kefalonia, Lourdas Beach. It is a short downhill walk to the beach, where this is a selection of tavernas and bars, as well as a few shops - perfect for those looking to leave the car at home. If you do choose to hire a car, the island's capital, Argostoli, and the Old Village of Skala can both be reached within 30 minutes' drive. Lourdas has a couple of small shops and mini markets, with the nearest 200 yards uphill from your villa - great for stocking up on holiday essentials. If you are looking for a greater selection then head to Argostoli, with some good clothes and souvenir shops, as well as a local fruit and vegetable market. An unspoilt and well-maintained resort, Lourdas has a number of good tavernas and bars offering a relaxed atmosphere. Many of the restaurants serve traditional Greek cuisine, but you will also find some seafood on offer too. Lourdas Beach is just 150 yards downhill from your villa and is often thought to be one of the most beautiful beaches in Kefalonia. A long sand and pebble beach, there are sunbeds and umbrellas available for hire as well as some local tavernas for lunch. In high season there is a life guard in attendance, and you can rent small motor boats from the beach. The best way to discover Kefalonia is from the water. Why not hire a boat and explore the pebbly coves and small bays, or spend the day snorkelling in the crystal clear water? The Old Village of Skala, just 30 minutes' away, has a lot character and is well worth a visit. It's a great place to relax with a coffee or cold drink and enjoy the views, or you can take a self-guided trail around the village and view the old Roman villa with spectacular mosaics. Alternatively, Argostoli is a modern harbour town with great restaurants and shopping, perfect for a day trip. If you enjoy walking then Lourdas has some scenic paths along the coast towards the Monastery of Sission and Katsonas beach. Villa Lourdas Beach is not available to book for season as it is sold out. Take a look here at the Kefalonia villas that are currently on sale. i already have booked for 2017. Arminda was really helpful and always at the end of the phone - one of the best Reps I have met! Location can't be beaten and the best pool we've ever had. Fantastic villa in an amazing location. Lying in bed listening to the sea was just perfect! 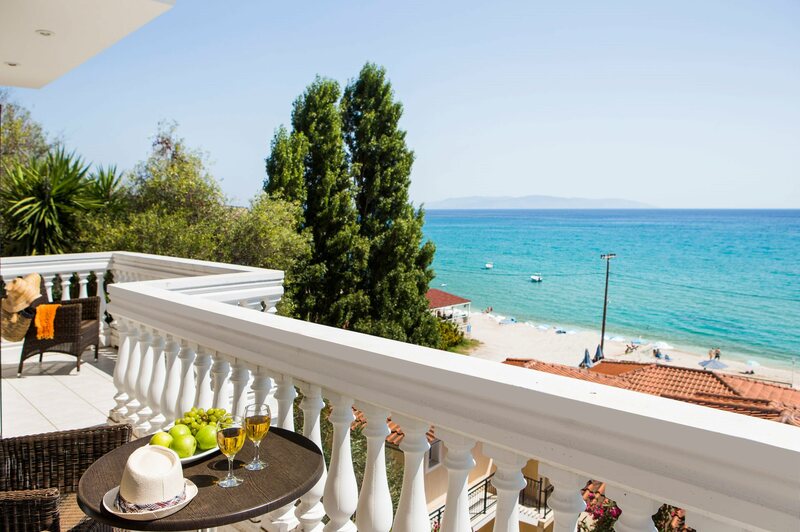 Stunning location, ideal for access to beach, shops and tavernas. Lovely holiday - Villa plus representative Arminda was great, she came to see us the day after we arrived and answered all our questions. Kefalonia was beautiful and the position of the villa was perfect. I have been on 6 Villa Plus holidays now and haven't had a bad one. This is probably the best villa we have been to with VP. Excellent villa and helpful owner. Fantastic Villa, clean, well maintained and a great pool. Location was perfect too, just a short walk to the local tavernas. And the stay was made even more pleasant with the lovely Villa Plus Rep - Arminda, who gave us some great ideas on what to do, where to go. Views from Villa were spectacular. Great position for the Beach and beach side tavernas. Stunning, the pictures on the website were an accurate representation. It was a beautiful villa, completely secluded from passers by. We found that the description and standards set out on your website was very accurate and we were pleased with the villa immensely. The location , privacy and scenery was excellent and thoroughly met our expectations.We will have no problems with booking with your company again and would highly recommend it to family and friends. The villa was well equipped, clean and comfortable. The pool was fab as was the shaded seating area and the balconies were great for catching those last few rays of sun. Our teenagers enjoyed using both the table tennis and pool tables. The villa was exceptionally well sited for the beach, mini market and beachside tavernas. We had a lovely, relaxing break and although it was tempting to stay put at the villa and Lourdas we managed to tear ourselves away and visit Assos, Ayia Efimia and Sami and looked down at Myrtos beach. Next time we come to Kefalonia we will have to make it up to Fiskardho! Everything, especially the helpful rep, just excellent! Mentioned it would be good to have a swimming cap.....Nicole appeared the next day with said item. She had scoured Agostoli for us! Big thanks. My third villa booking through Villa Plus and by far the best villa so far. The villa was well equipped Excellent location just behind the beach.